Holy cow I’m in a bad mood. And the only cure is cute, colourful animals. A few months ago, I had the good fortune to be able to observe artist Jeremy Tankard give a comic creating workshop to a group of middle and high school students during the Fry [Literature] Festival. The hour or two he did with Jimmy Beaulieu (a better site, but in French) was a pretty big influence on how I have conducted my comic creating workshops ever since. 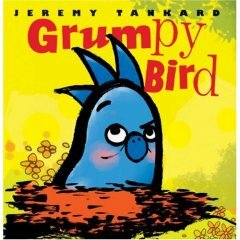 But the only thing that has to do with what I am talking about here is the part where I was introduced to Mr. Tankard’s children’s book, Grumpy Bird. Bird wakes up feeling grumpy. Too grumpy to eat or play -- too grumpy even to fly. “Looks like I'm walking today,” says Bird. He walks past Sheep, who offers to keep him company. He walks past Rabbit, who also could use a walk. Raccoon, Beaver, and Fox join in, too. This is everything I look for in a kid’s storybook. It’s got: goofy, wildly colourful art; a funny cast of characters (Canadian Tankard included a beaver! Yay Canada! ); and a grumpy protagonist looking like a dork (my life J ). Alright! I can’t take it any more! I am a complete sell out! After Tankard’s workshop I hung around and had him draw a sketch for both my class and for me (I have one in my class and one hanging behind me as I type right now). My only regret is that I didn’t have him draw me a sketch of the little girl superhero he has on his business cards for my daughter. I’m such a sell out. Sigh. I like my sketches, and I wouldn’t have wasted my time if I didn’t like what I saw….So there. I like Grumpy Bird. You might too. You can find it in Canada’s November PreK-K (which you can still order from) Scholastic order form for 5$ each. A good deal for a book you can get a lot of mileage out of in an early years guidance/health class (Grumpy behaviour and how to beat it. The lesson practically writes itself). Even if you are not a sell out like me, you will probably enjoy Grumpy Bird. I promise nothing though. So back off chump……See what I did there? I ended on a grumpy note. I’m clever like that. Be sure to visit us at comicsintheclassroom.net for your all ages comic book needs.